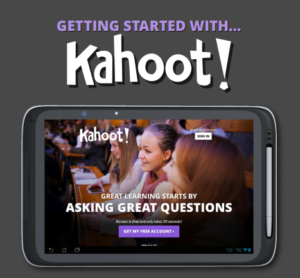 Kahoot is a free student-response tool for administering quizzes, facilitating discussions, or collecting survey data. It is a game-based classroom response system played by the whole class in real time. Questions are projected on a shared screen, while an unlimited number of players answer the questions with their smartphone, tablet or computer; creating a social, fun and game-like environment. Kahoot allows for the design of multiple-choice quizzes as well as polls and surveys that populate on-the-spot data; the quiz questions and polls stimulate quick instructional decisions as well as whole-class discussion. According to Bransford, Brown, and Cocking (1999) “assessments and feedback must focus on understanding, (and) assessments that emphasize understanding do not necessarily require elaborate or complicated assessment procedures. Even multiple-choice tests can be organized in ways that assess understanding” (140). As an assessment based tool, Kahoot supports pre- assessments, productive formative assessments and student reflection, through fun quizzing, quick polls and surveys. Bransford, J. D., Brown, A. L., & Cocking, R. R. (1999). How people learn: Brain, mind, experience, and school. Washington, D.C.: National Academy Press. Substitution: Students participate in a Kahoot quiz to answer questions at the end of a unit instead of using a traditional paper quiz. 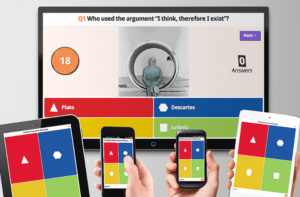 Augmentation: Kahoot acts as a direct tool substitute of a formative assessment, with functional improvements such as the feature of adding video and images during a quiz to tap into the student’s knowledge, and reach different learning styles. Modification: A Kahoot discussion allows for significant task redesign by engaging students in conversations after looking at a short video. Redefinition: Kahoot allows the participation of an unlimited amount of students or players in a survey in real time. Science 2nd Grade: Habitat Review 2nd grade students play this kahoot as a pre-assessment before learning about habitats and animals’ adaptations. 2-LS4 Biological Evolution: Unity and Diversity. ESL Level 1-3 Speaking: What is the Best Holiday Celebration in your Family ESL students respond to this discussion question and engage in a conversation after seeing their class’ results. Reading – English/Language Arts 2nd grade: Peter’s Chair Story Elements After reading the story “Peter’s Chair,” students participate in this engaging quiz to show their reading comprehension and knowledge about the elements of a story. CCSS.ELA-LITERACY.RL.2.1 Ask and answer such questions as who, what, where, when, why, and how to demonstrate understanding of key details in a text. Geography 4th grade: Midwest Region Students use this kahoot to test their knowledge about the Midwest Region of the United States. After looking at the results, and reading a text about this region, they retake the test to engage in post-assessment questions that will help measure not only comprehension, but changes in knowledge about this subject. How Should You Engage with Inclusive Design – Kahoot! 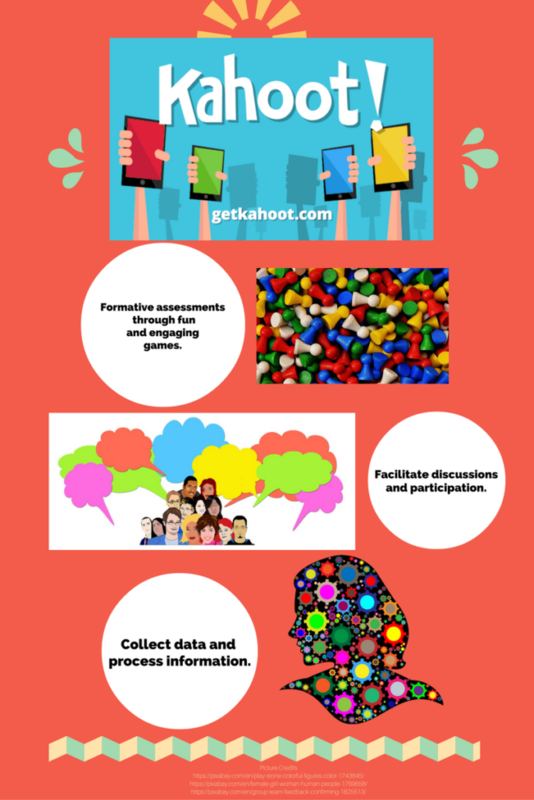 Engaging and Assessing Students with Technology: A Review of Kahoot! Go to getkahoot and sign up for a free account. Once on your dashboard, choose the type of Kahoot to create from scratch, or duplicate another. Click ‘Next’ when you’re ready to go back to the overview page and save or add another question. You can adjust the question’s time limit, edit, duplicate, or trash your questions at any time. Add and revise. After you’re back on the overview page, you’ll see your questions just above the ‘add question’ button. The tools on your dashboard will allow you to edit the description text/tags, cover image, and intro video. Review, Play, Share! Once you’re happy with the content you’ve made, click the ‘save’ button at the top of the overview page. You will be given options to edit, preview, play, or share your new kahoot. If your browser is not at least 1200 pixels wide, the ‘Preview’ button will not be available. For a more detailed guide, check the official Step-by-Step-Guide by Kahoot! If you’re leading a Kahoot for others to play, your device should be connected to something that all of your learners can see, such as a projector screen or large TV for playing locally, or a service like Youtube Live or Skype to stream your screen online. Once you have selected a Kahoot to play, you will need to select a game mode (classic or team) to launch the Kahoot. Play! You should now see a lobby screen, where instructions to go to kahoot.it and enter a game PIN are displayed. Leave this page open and have your learners follow the instructions on their own devices. As they join, you’ll see their nicknames appear on your screen. Click ‘Start’ once everyone’s joined. Use the ‘Next’ button to move through results screens and get to the next question. Once all questions have been answered, you’ll be able to collect feedback on the kahoot from your learners and download results. Dellos, R. (2015). Kahoot! A digital game resource for learning. INSTRUCTIONAL TECHNOLOGY, 49.